The area was well-represented on the Ohio High School Volleyball Coaches Association All-Ohio teams released Monday. East Liverpool’s Skye Stokes was named to the first team in Div. II, while Salem’s Echo Mayer-Kutz was named to the second team in Div. II. Crestview’s Emily Emch was a third-team pick in Div. III. On the coaching side of things, Wellsville’s veteran leader Dan McKinstry was given a coaching achievement award in Div. IV for leading his team to a league title and a Div. IV regional final. Stokes, a junior outside hitter/setter, played 71 sets and a had an 82.5 serving percentage for the Potters who advanced to the Div. II district final and won the OVAC Class 4A title. She added 215 assists, 380 kills, 20 solo blocks, seven assisted blocks and 244 digs. Mayer-Kutz, a junior middle and outside hitter, played a big role in gaining the Quakers a share of the Eastern Buckeye Conference title and the Div. III district championship. Mayer-Kutz played 84 sets and registered 370 kills, 49 total blocks, 48 aces and 283 digs. 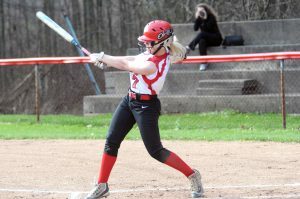 Emch, a senior middle-hitter, contributed heavily to a Rebel season which included the OVAC Class 3A title and the All-American Conference Blue Division championship. She played 80 sets and registered 233 kills, 63 blocks and 42 aces. Wellsville senior middle hitter Kiki Perry was named an honorable mention in Div. IV.